Every Monday is Health at Work day here at The Daily Mind. Today I want to tell you about the benefits of freshly made fruit and vegetable juice. Many years ago I got into freshly made juice when I was on a health kick and now I really take for granted how good this stuff is for me. This morning, however, I was meeting a friend in the city central markets before work and as usual I grabbed a fresh juice. I suddenly remembered you guys I decided that I would try and convince you to try some fresh juice on your way to work tomorrow. When I say fresh juice I am talking about juice that has been juiced right in front of you. Many health food stores sell this stuff when you can get a combination of vegetables and fruits juiced right in front of you. This type of juice is one of the best things you can do for your health. What I am NOT talking about is bottled juice from the store. This stuff has been heated up and had so many preservatives added to it that it can no longer be classified as a health drink. Why is fresh fruit and vegetable juice so healthy? More absorbtion: When you drink your fruits and vegetables you absorb up to 80% more of the nutrients. That is a massive amount of minerals, vitamins, etc. that you would otherwise be missing out on. More fruits and vegetables: People in today’s world are not eating anywhere near the required amount of fruits and vegetables. Jucing them allows you to pack more into your day thus helping your health. Good for your organs: Juicing your fruit reduces the amount of work your digestive organs have to do and has been shown to increase the health of the liver, kidneys, etc. This kind of thing leads to better immunity and overall better long term health. One of my favorite benefits, however, is the sheer variety of vegetables and fruits that you can get in one sitting. This morning I had a delicious juice with beetroot, ginger, apple, carrot, celery and wheatgrass juice. There is no way I would be able to eat all these for breakfast without the juicing! One of the main reasons I get fresh juice on a regular basis is simply because it makes me feel good. After a big cup of fresh juice I always feel lighter and much more energized and that energy seems to last for a lot longer than regular foods and drinks. It certainly makes me feel better than a coffee. So what do I put in my freshly squeezed juice? I had this combination this morning and I think it is my favorite. Foods like ginger and beetroot really clean out the blood which is a great way to cleanse your body and heal and minor health problems. However, don’t feel limited by this combination – feel free to add any fruits of vegetables that you like. On your way to work tomorrow I’d love you all to stop and buy a freshly made juice for breakfast. Take it to work with you and let me know how your day turns out. I bet you feel better than ever! I like to drink juie with breakfast but it is always just bottled or something like that. I didn’t realize that it weasnt as healthy for you. i think i will try getting some freshly wsqueexzed stuff when i am in the markets next time. Again, another fantastic post! I am beginning to like Monday’s now! 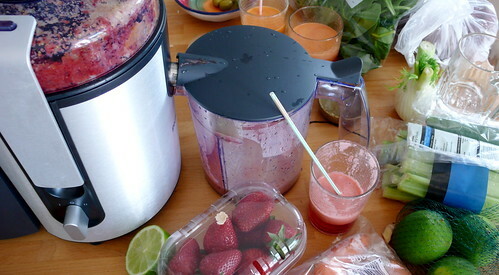 If you get a home juicer you can make your own, and save a huge amount of money. After you get your vegetable garden in order, that is. But take it from me it’s worth the effort and time put in. Each glass of fresh squeezed veggie juice is the equivalent of maybe 10 salads…and it’s much easier to digest too. Gary Null suggests 6 to 8 a DAY…if you’re on a detox program and/or fighting any degenerative disease. But beware…these juicers are modern devices so don’t be fooled… it takes a lot of work to juice down a pitcherfull of green….just chalk it up to a big hunk of your daily exercise needs! But stay with it cause the feeling in your body is like NOTHING you’ve ever felt…I’m almost afraid to describe it cause it might sound like I describing something illegal! You are so right – the feeling of a freshly squeezed juice is really awesome! The energy is lasting and really vibrant. Do you have any recommendations for a brand of home juicer? I don’t own one yet. I have a Waring Pro….paid less than $100…and one reason is that it has a plastic pusher…so if you have to push it OUT by banging it with something to extract it…you may end up with a small hole in it…which may get bigger, so make sure yours has a metal pusher. I think getting a metal one sounds like the right idea. The cleaning sounds like a bit of a hassle though. Here is an alternative juicer you might consider. I use a Greenstar juicer. It cold-presses the fruits and vegetables, has no sharp parts, has interchangeable straining screens, and it is very quick and easy to clean once you get used to it. Also, I keep our juicer on the counter within reach. That way, I am more likely to use it instead of having to dig it out of a cabinet. The Greenstar is a little pricey. It pays for itself in the added beneficial qualities of the juice it produces. Patria I’d say you have an allergy. That is not normal. my favorite so far is pumello with a splash of honey. But orange, apple, strawberry is a close second.. Thanks for the nutritional facts! A little late replying to your post. But I had the same thing happen to me. Turns out I had parasites! They hate carrots and carrot juice. After I got rid of them, I have not had a problem. Different people have diffrent reactions when it comes to drinking freshly squeezed veg and fruit juice espesially in the beginning. The fresh carrot juice is very potent and the best out of all vegetables for cleansing your body. The symptoms you experience will subside eventually please don’t stop!!! It also tells you that your bodyis very toxic and the juice is really working. How many mls do you drink a day? You should start with only 8 oz=240ml and then increase when you feel better and see benefits. Also watch your diet: decrease dairy products and protein as they are very acidic. At this time you would need more alkaline foods such as fruits and veggies, nuts, green tea, distilled water. Good luck! Fresh juices will save your life!!! I appreciate your insights regarding fresh squeezed juice! My husband got me a juicer, and I think it’s the best gift I’ve ever gotten (I don’t mean intangible gifts, of course). I drink two glasses of fresh juices every day; mostly a mix of carrots, celery, and parsley, or beets, apples, lime, and cucumber. Now, I will use your recipe with ginger! Thank You from my healthy body and mind – – fresh juice helps to feel holistic.